Subaru is adding a flagship 2013 Outback 2.0D diesel variant to the Australian lineup that will be mated to a new CVT automatic for the first time. Up until now, Australians could only buy a new Subaru Outback diesel with a standard transmission. But now, Subaru is adding automatic diesel variants to its Outback All-Wheel Drive (AWD) crossover line-up for the first time. The new 2013 Outback 2.0D CVT will give buyers outstanding range, fun driving, efficiency and a new space to play. Subaru has designed their new CVT automatic so it will be able to stand the extra torque of their highly capable and efficient 2.0-liter four-cylinder turbocharged horizontally-opposed Boxer diesel engine. Engineers had to rework the new Lineartronic CVT (Continuously Variable Transmission) so it would handle the rigors of the torquey diesel powerplant. The result is an Outback variant that is an incredibly capable AWD package. The highlights include an Adaptive Transmission Control, delivering highly responsive driving, in tune with engine speed changes. The new Outback 2.0D CVT will also get a seven-speed Manual Mode, achieving faster, smoother gear changes compared to conventional automatic transmissions. Subaru built their first diesel back in 2004 and incorporated the horizontally opposed boxer technology into their diesel engine. The design cancels out inertial forces that cause vibration and noise, thanks to their horizontally opposed pistons and requires no balance shafts. The design is unlike inline diesel engines in that the Subaru Boxer Diesel features low vibration, a low center of gravity, and high rigidity. With the 2.0-liter turbo diesel coupled to the new CVT automatic, the advantages will be even more efficiency and increased fuel mileage. All 2013 Outback 2.0D CVT variants are powered by a turbocharged 2.0-liter four-cylinder horizontally-opposed Boxer diesel engine, producing 110 Kilowatts of power (147 hp) and 350 Newton meters of torque (258 lb ft). In the combined cycle, fuel consumption is an impressive 6.5 liters per 100 km and carbon dioxide emissions 172 grams/km. The new automatic Outback diesel also features high levels of noise suppression, great take-off acceleration and linear steering, with minimum body roll for stability in the corners. The entry-level Outback 2.0D CVT includes factory-fitted satellite navigation, while the 2.0D Premium with CVT adds a variety of features including, power sunroof, leather trim, eight-way power driver’s seat with memory function, and electroluminescent gauges with color information display. The automatic diesels also get a number of other changes to the Outback 2013 line-up, including a revised grille, front bumper, foglight surrounds and new wheel patterns. Subaru Australia has announced significant changes to the 2013 Outback 2.0 Diesel Premium model, and it will get a price drop of $4000. The standard Outback 2.0 Diesel also gets a price reduction of $1000, yet adds factory-fitted satellite navigation. And the diesel variant adds new design alloy wheels and a color information display. 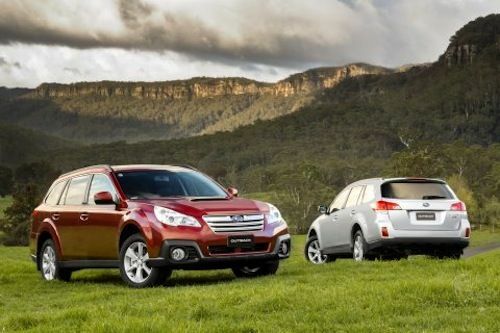 The Australians get to enjoy the benefits of the 2013 Subaru Outback 2.0 Diesel variant with a six-speed standard transmission and now with Subaru’s newest Lineartronic Continuously Variable Transmission (CVT). When will we see a Subaru diesel in the U.S.? With the rapidly expanding China market increasing demand for fuel, prices could take off more abruptly than analysts predict. If that happens American small-car buyers will be much more likely to pay extra for that Subaru Outback diesel. I'm glad to see Subaru is finally offering the 2.0 litre Boxer Diesel engine with the Lineartronic CVT transmission. It's just unforgivable, however, that the Boxer Diesel has never been imported to North America. Is diesel for everyone? No, of course not. But as car buyers, we should be allowed to make that decision, and not car makers.